An amazing surgeon, my knees feel great and the only downfall is they aren’t so comfortable on a jet ski. The aftercare I received was fantastic and I was walking again 2-3 weeks after the surgery, this allowed me to be able to return to full time work once healed. Adrian Harvey is a Consultant Orthopaedic Surgeon in Dorset. He qualified from University College London in 1991 and then went on to train in surgery in London and on the Wessex orthopaedic training programme. In the latter part of his training he underwent specialist training in knee surgery and arthroscopic surgery in Perth and training in skiing injuries in Switzerland. Adrian rowed at university in London and competes in open water swimming events and continues to sail competitively. He has treated many athletes and military personnel and understands the benefits of being able to continue to participate in sporting activities throughout life. In 2002, he was appointed as a Consultant Orthopaedic Surgeon at the Royal Bournemouth Hospital and Poole Hospital in Dorset. Adrian is a faculty member on a number of national and international courses. This involves teaching surgeons in many aspects of knee surgery, including knee replacement surgery and anterior cruciate ligament reconstruction. He is part of European design team, and has designed a new type of high functioning knee replacement. Adrian is trained in the latest techniques in knee surgery including computer designed patient specific instrumentation, robotic assisted surgery and custom knee replacements. The use of stem cells to treat orthopaedic cartilage conditions also forms part of his orthopaedic practice. Each year he trains 2 Knee Fellows from Europe in specialist knee surgery. These surgeons subsequently return home to become consultants in their native countries. Adrian is a reviewer for the British Journal of Bone and Joint Surgery. 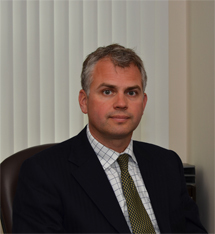 Adrian is a member of the British Orthopaedic Association and the British Association for Knee Surgeons. My grateful thanks to you and your team for my total knee replacement surgery. My knee now functions as a totally normal knee, I am totally unaware of its presence, ( except when passing through airport security!). I have full flexion, extension and rotation and have resumed all my previous activities, hill walking, cycling, dinghy sailing, and canoeing. I am now totally restored to the active quality of life that I enjoyed prior to the knee degradation. A revelation! What has been so helpful has been your restoration of the leg back to its normal length, overcoming the 1.5 inch shortening, caused by the deformity of the worn-out joint, a legacy from playing rugby! Much praise too for the physiotherapy team, who with their help have I been able to restore full muscle strength and mobility to the leg. Cosmetically, both legs are now the same size and shape, without any swelling, the only clue to the knee replacement is an almost invisible scar over the knee. Praise is also due to the ward team for their great care and attention and the anaesthetist Dr. Schuster Bruce. Copyright © 2018 Harvey Orthopaedics Services Limited. Adrian Harvey - Consultant Knee Surgeon offering solutions for Knee cap instability, Arthritis, Tendon problems, Knee replacement surgery, Ligament injury .